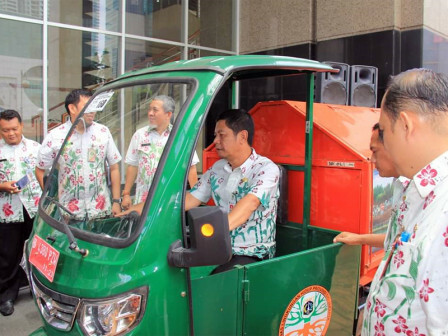 West Jakarta Mayor, Rustam Effendi received 112 motor waste carts (germor)s from Jakarta Environment (LH) Department and distributes it to 56 West Jakarta's urban villages.
" I hope it could be functioned optimally to realize clean environment"
"Each urban village receives two additional motor waste carts. So, each urban village now has five motor waste cars," he stated, Thursday (2/7). He wants each urban villages to optimize transporting waste, especially to take garbage from settlements that can't be reached by garbage truck. "I hope it can be functioned optimally to realize clean environment," he added. West Jakarta LH Sub-department Head, Edy Mulyanto explained, Jakarta LH Department is responsible for motor waste carts' maintenance for the first one year while his side is responsible to fill the fuel for its operational. "Our job is to provide three liters gasoline every day for all motor waste carts. After one year of use, urban village is responsible for motor waste carts' operational needs," he explained.